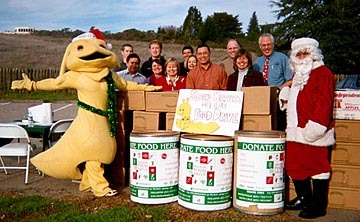 Sammy Slug joins Second Harvest organizers at an earlier drive. Sammy will be promoting contributions throughout this week. Sammy Slug will be at the main entrance to campus today through Friday, December 3, urging contributions to the Second Harvest Food Drive. Donate your extra dining hall meals or flexi dollars online to benefit the Second Harvest Food Bank. For every dollar donated, the food bank can distribute $9 worth of food. The Student Affairs Office has set up a donation web site, now through December 5. Sammy will be telling people, as best as Sammy can, to open up their pocketbooks, said Manuel Grijalva, UCSC Mail Services manager. A Campus Mail Services truck will be parked at the main entrance through Friday, December 3, to accept donations of food. Donors are also being encouraged to consider donating cash or writing checks, since Second Harvest can use this type of donation year-round. The campus goal is to collect 50,000 pounds of food and cash equivalent donations toward a community goal of one million pounds. Last year UCSC collected 49,535 pounds. Second Harvest Food Bank is a nonprofit organization providing food and basic necessities to people in need. The drive is cosponsored by the Academic Senate and the Staff Advisory Board. Checks, which must be written by December 6, should be sent through interdepartmental mail to Campus Mail Services, and made payable to Second Harvest Food Bank. The food drive ends Friday, December 10. For every dollar donated, Second Harvest is able to distribute more than $9 worth of food. A $15 cash donation provides a family an average of 63 meals. The Food Bank credits UCSC with three pounds worth of food for every dollar contributed.